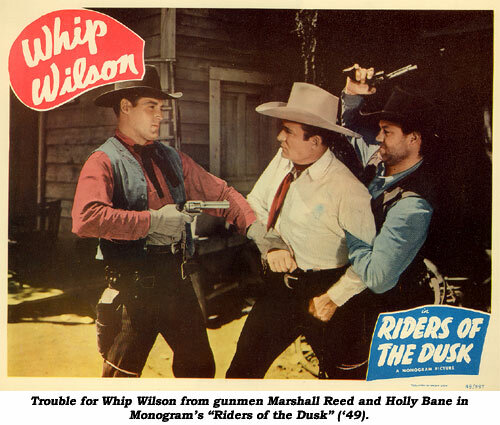 Marshall Reed was to Monogram what Roy Barcroft was to Republic—their resident badman. 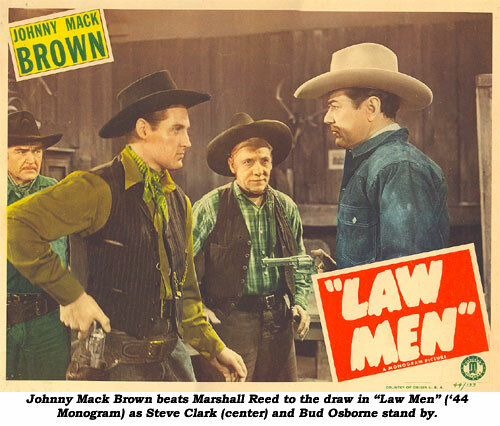 He menaced the late ‘40s Monogram cowboys (Johnny Mack Brown, Whip Wilson, Jimmy Wakely) in as many films as he did the stars at all the other studios (Republic, PRC, Columbia, RKO) combined. 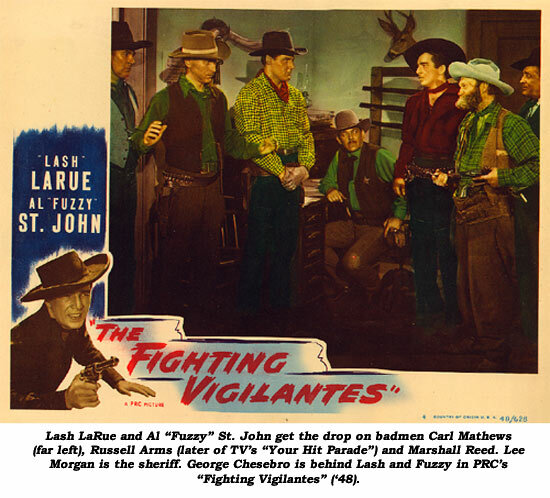 Coming to the business in an unbilled bit for Roy Rogers’ “Silver Spurs” (‘43 Republic), his tall handsome looks quickly advanced him to major roles such as in “Texas Kid” (‘43 Monogram) with Johnny Mack Brown and “Haunted Harbor” (‘44 Republic serial), almost as if the studios were eyeing him for a starring series. As a matter of fact, he almost made it a couple of times. 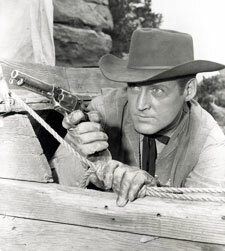 He was one of many under consideration for the “Lone Ranger” TV series (‘49-‘57) which went to Clayton Moore and was nearly cast as Red Ryder at Republic. 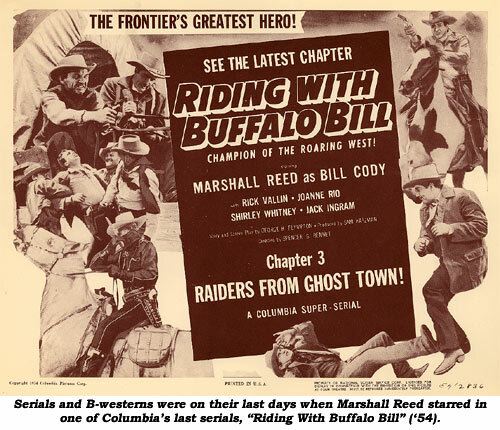 Finally, in 1954, Columbia starred Reed in 15 chapters of “Riding With Buffalo Bill”. But it was too late, the serials and westerns were all but over. Reed returned to playing heavies on all the early B-western-styled half hour TVers. Reed found a regular paycheck from ‘54-‘59 as Lt. Fred Asher, a regular role on “The Lineup” for CBS (syndicated as “San Francisco Beat”). Roles were sparse in the ‘60s and his final films were sadly in ill-received lowbudget quickies (“They Saved Hitler’s Brain” ‘68, “Hard Ride” ’70; and “Til Death” made in ‘72 escaped in ‘78). Thankfully, there were a few nice (but small) roles for TV during this period on “Adam-12”, “Marcus Welby, M.D.”, “Cannon” and “Apple’s Way”. He also produced and directed several TV documentaries for charitable organizations on behalf of crippled children and retarded adults. Marshall Jewel Reed was born in Englewood, Colorado, May 28, 1917. His father, Walter George Reed, was a Colorado native and his mother, Ruth Dustin, was from New Mexico. Marsh (as he was often called) began his acting career early, appearing in children’s theatre at 10. During high school Reed managed two of his own theatre groups. After high school he supported himself with various odd jobs such as horse trainer, meter reader, bookkeeper and mail clerk. His professional career began with Elitch Gardens Summer Stock Theatre in Denver by building and painting scenery, making costumes. He eventually acted in some of the plays staged there, then began to write, produce and act for a variety of theatre groups in Denver. Following that, Reed toured throughout the U.S. with his repertory group and acted in summer stock in New York and Los Angeles. Reed came to California in 1942 and worked nights at Lockheed while he started his career in pictures. Reed served with the Navy in the Pacific during the last portion of WWII (circa ‘44-‘45), then returned to Hollywood to resume his film career. Reed was active in the Masquers Club, a theatrical organization in Hollywood, where he was an officer on the board of directors as well as serving as chairman of the Theatre Committee from ‘65-‘67. In this capacity, he designed and directed “Twelve Angry Men” and “The Royal Family” as well as designing sets and executing lighting for other Masquers productions. 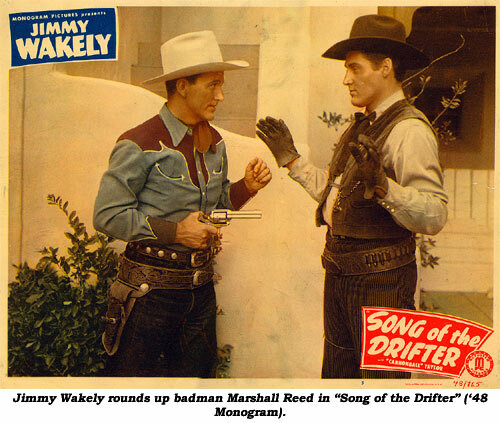 He was also the head of Marshall Reed Enterprises, his own film equipment rental company. A few years before he died, Reed redesigned the Paramount Ranch in Agoura for “Shame, Shame On the Bixby Boys” (‘78) which starred Monte Markham. 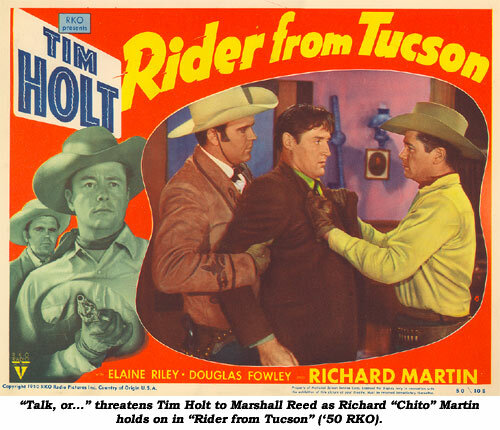 Reed had a small role in the film. The last of Reed’s five wives was Carlyn Miller. They were living at 5111 Babcock Ave. in North Hollywood when Reed died of a massive hemorrhage at Tarzana Medical Center April 15, 1980 at only 62. He had suffered from an earlier brain tumor. He was cremated and placed at Harbor Lawn Memorial Park in Costa Mesa, California.